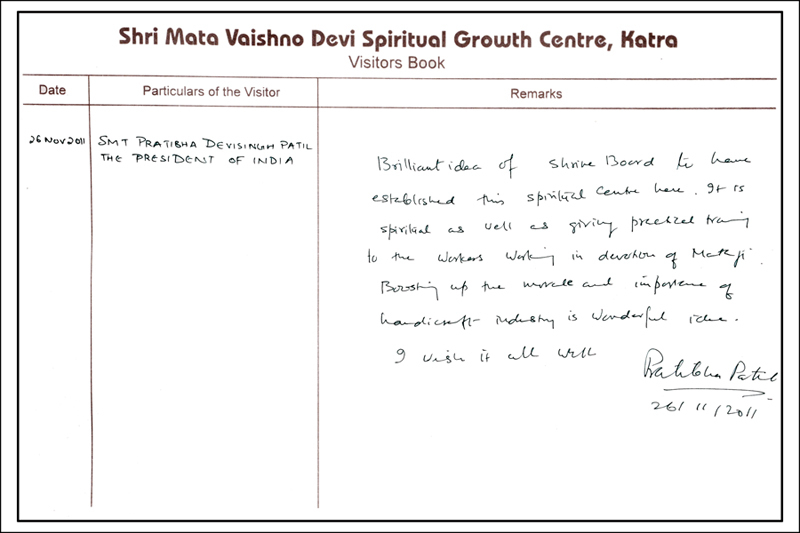 President'S MessageShri Mata Vaishno Devi Shrine Board in its continuing endeavours for providing more facilities to the pilgrims visiting Shri Mata Vaishno Devi as well as for adding spiritual dimensions to the pilgrimage has established a world class Spiritual Growth Centre in the lap of Trikuta Hills at Katra, the base town for the Yatra. One of the most prestigious infrastructure projects of the Shrine Board, it was inaugurated by Smt. Pratibha Devisingh Patil, the then President of India, on 26th November, 2011 in the presence of Shri N. N. Vohra, Governor Jammu and Kashmir, who is Chairman of the Shri Mata Vaishno Devi Shrine Board. Spacious and state-of-the art Spiritual Growth Centre, has unique kind of facilities under one roof to meet the spiritual needs of the visiting devotees and to facilitate research scholars. It has 24x7 power back-up and equipped. To acquaint pilgrims with the concept of this pilgrimage and the story of Shri Mata Vaishno Devi Ji. Carry out various modules/ programmes of spiritual nature/yogic exercises/ make available Ayurvedic facilities etc. Make available spiritual literature for reading. Providing pilgrims/visitors an opportunity to witness and procure exquisite items based on handicrafts created by Self-Help Groups etc. Present the local culture in various art forms.